WASHINGTON – Today, Cause of Action is pleased to announce that a federal court in Delaware has approved a settlement agreement between our client, FuelCell Energy, Inc., and Delaware Governor Jack Markell and Delaware state utility officials regarding the state’s Renewable Energy Portfolio Standards Act (REPSA). Under the terms of the settlement, Delaware’s Public Service Commission (DPSC) must now allow competition across state lines with respect to fuel cell manufacturers, in compliance with the commerce clause of the United States Constitution. In a 2012 complaint filed in the United States District Court for the District of Delaware, Connecticut-based FuelCell Energy alleged that it was disadvantaged by the DPSC‘s special tariff awarded under REPSA to an in-state energy manufacturer and the associated State financial support for establishing in-state manufacturing that was offered to only one select company by the Governor of Delaware, without any prior public notice or bidding process. FuelCell Energy, a global fuel cell company that designs, manufactures, installs, operates and services efficient and affordable stationary fuel cell power plants, argued that Delaware’s Renewable Energy Portfolio Standards Act, which was amended in 2011, violated the commerce clause of the United States Constitution, which prohibits state laws that discriminate against out-of-state competition. Under REPSA, the State of Delaware only allowed bids on a State fuel cell project from a fuel cell company that agreed to establish manufacturing in the State, and the State provided financial incentives to support construction of the manufacturing facility, resulting in a sole-source contract rather than a competitively bid contract. In April 2014, the District Court permitted FuelCell Energy to proceed with its constitutional claim. The settlement agreement that we are announcing today will level the playing field for all out-of-state fuel cell manufacturers wishing to compete for business in the state of Delaware. Prior to this settlement, out-of-state fuel cell power plant manufacturers were prohibited from bidding on REPSA-funded incentives for fuel cell power generation projects, a violation of constitutional prohibitions on state-legislated discrimination against out-of-state businesses. Cause of Action is a non-profit, nonpartisan strategic oversight organization committed to ensuring that government decision-making is open, honest, and fair. CRI’s views: Although CRI was not involved in this lawsuit, we were very much supportive of it. Bloom Energy is a perfect example of crony capitalism, where over half a billion taxpayer dollars were promised to a company whose technology was not only unproven to work, but actually was proven to be even more polluting than the alternative solution, which was to build more natural gas pipelines and transmission stations in Delaware. Bloom did not even have to go through a competitive process to obtain the grant; it was awarded to them. We hope this lawsuit will serve as a notice to Delaware’s state government that crony capitalism is not the answer to providing clean, affordable energy to Delawareans. We should support proven, reliable methods such as natural gas and nuclear power to reduce our carbon emissions and keep electric rates affordable. For more information on our energy plan, visit caesarrodney.org and click on the Center for Energy Competitiveness tab under “issues”. 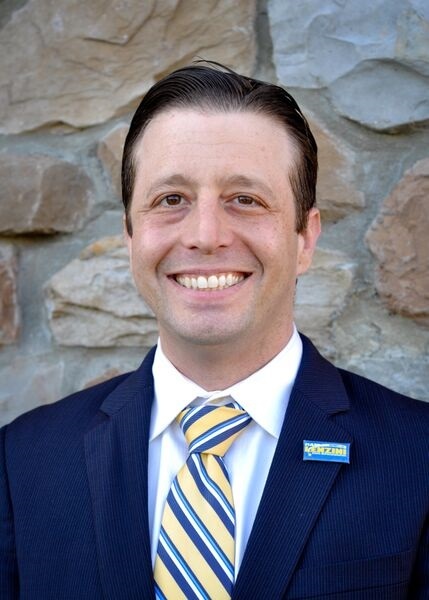 Guest post by Matthew Lenzini, chairman of the Colonial Region Republicans. I can’t recall a time when both of my parents didn’t work. My father for most of my childhood worked nights and weekends managing a Diner in South Philadelphia. My mother waited tables as a night shift waitress at the Philadelphia Airport Marriott. My first job in High School paid $4.75 an hour and truth be told, given my skill set at the time, I was probably overpaid. My parents instilled a sense of hard work and frugality in me that exists to this day. We never had much money and though I have been able to find some success in my life, I am a firm believer in adding value to society and living below my means. I believe that personal growth and success are core American Values. I believe that we live in the land of opportunity and that with hard work and a little luck, everyone has the ability to better their circumstances. This by no means, guarantees success but unlike many countries in the world, we all have a shot at the American Dream. The first minimum wage was enacted in the United States in 1938. At the time, the rate was set to $0.25 cents an hour. There is a popular myth that the minimum wage rate has not kept up with inflation. If the 1938 wage were adjusted for annual inflation through 2015, the minimum wage rate would currently be around $4.90 give or take a few pennies. The federal government has reset minimum wage a number of times; typically during or after periods of rapid inflation. The table below highlights a few of the federal adjustments to minimum wage and the inflation adjusted wage today if there were no additional adjustments to the wage by the federal government. I’d like to note a few things regarding the table above. Inflation adjusted, the minimum wage has fluctuated some but typically stays within one or two standard deviations of the average, which is approximately $8.20. We have had an inflation adjusted range high of $10.07 in 1981 and a low of $4.97 in 1939. All in all, the current rate of $7.25 is well within one standard deviation, which is about +/- $1.25 of the average (this is well within tolerance limits for statistical measurements). Now, there is an argument that rather than using inflation, one should use the Consumer Price Index. After all, the cost of goods and services changes over time. CPI uses a baseline year (1984) as an index. As such, 1984 has an index of 100 and all other years are adjusted using a percentage of the index. For instance, 1939 has an index of 13.9. If we take the 1981 wage of $3.35 and multiply it by 13.9 percent, we have a 1939 equivalent rate of $0.47. 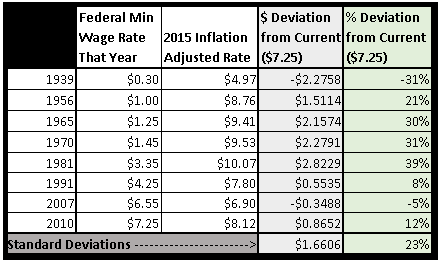 If we were to use similar dates to our inflation based analysis, we would get the following CPI adjusted rates. Again, we find that the federal rates are within a reasonable level of tolerance of the average. The greatest deviation occurring in 1939, one of the first years that a minimum wage ever existed which also happens to occur in the midst of the great depression. The U.S. labor participation rate is currently sitting below 63 percent. The last time the rate was this low, was in the late 1970s when we had according to President Carter, a crisis of confidence. The reason I use the labor participation rate instead of the more popular unemployment rate is that the unemployment rate only represents people that are actively seeking work. Anyone that has given up the hope of finding work, does not show up in the U.S. unemployment figures. The “real” rate of unemployment is closer to 10 or 11 percent. The unemployment rate has improved for the wrong reason; people have stopped looking for jobs. A number of legislators have pushed for an increase in the minimum wage. Their thought process is that a higher minimum wage will improve the economy and get people back to work. Unfortunately, that is very far from the economic reality. The labor market reacts similarly to any other market. It is primarily driven by the laws of supply and demand. Without a minimum wage (which is effectively an artificial floor on the price of labor), the market would settle at a rate where the demand for labor and the supply for labor meet. In other words, without an artificial floor, we would reach the maximum economic output and we would have the lowest level of unemployment (excluding externalities such as a disincentive to work because one could “make” more on government subsidies aka welfare). Artificial floors create economic loss. 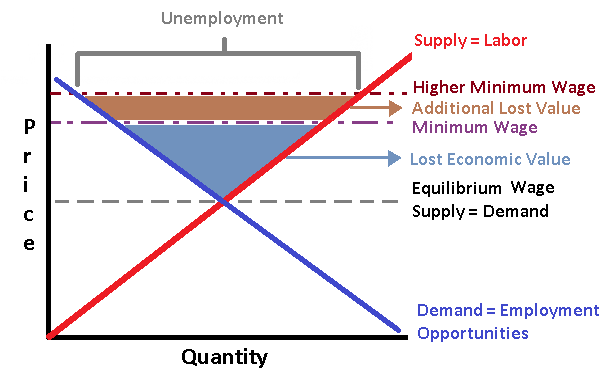 Essentially, supply will be higher than demand and the gap, essentially becomes unemployment. The higher the wage, the more people will be willing to work so there is more supply. However, given the higher wage, a business with limited resources will be able to hire fewer people. The graphic below highlights the conceptual increase in unemployment when the artificial floor is raised. This is not unique to labor, it is an economic reality for all goods and services. The unemployment rate is the gap that exists between the supply of labor and the demand for labor. Howard Schultz the CEO of Starbucks was asked about the $15 minimum wage in Seattle. He said that Starbucks would adapt. They can leverage technology and automation allowing them to hire fewer people but smaller companies don’t have that option – “I wouldn’t want to see the unintended consequences of job loss as a result of going that high. That would not be the case at Starbucks, but I suspect that most companies, especially small- and mid-sized companies, would not be able to afford it.” The net effect will be one of a few scenarios: a) the company uses more technology to maintain its margins b) the company raises prices c) the company goes out of business. None of these bode well for the employees or the consumer. There is a myth that the average age of a minimum wage earner is 35 years old. I believe that this is a purposely misleading statistic, put forth by certain politicians seeking populist support for re-election. If you have four 17 year olds and two 68 year old retirees (who are most likely working to have a second income above any retirement benefits), you have an average of about 35. When we look at the underlying data, we do in fact see that the distribution is skewed towards young people who are working in their first job and older Americans who may be working to supplement their income. So let’s also be clear that only about 4.3% of all working Americans earn the minimum wage. Most other workers earn more than the current rate. That number is down significantly from the 1980 high, where 15% of working Americans earned the minimum wage. 50% of minimum wage earners are under the age of 24 and 25% of minimum wage earners are teenagers. The vast majority 64% are part time employees who mostly occupy low skill jobs in the food services or retail spaces. Only about 20% of those that receive minimum wage are married and only 13% of minimum wage earners are married and over the age of 25. The vast majority, nearly 80% do not have a college education and most do not have a high school diploma. So the argument that too many Americans are trying to support their families on minimum wage is just not true. The percent of family head of household minimum wage earners is actually the lowest it has been since the metrics have been tracked, and the path to higher wages is and always should be improving your skill set. A common element that is often missed in the debate surrounding minimum wage is the role of the earned income tax credits. Many supporters of raising the minimum wage will state that the intent is to help young working heads of household, support their family. Unfortunately, by raising the minimum wage, we do the exact opposite, as mentioned above, when we raise the wage uniformly, we actually create higher levels of unemployment. 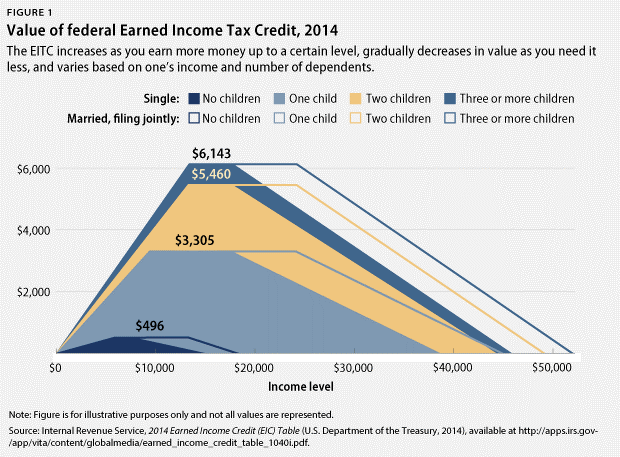 A better targeted approach to helping families, is to continue to leverage the earned income tax credit. The earned income tax credit provides a financial benefit to those that are heads of their household and those with children. In essence, it is a much better way to pinpoint those working adults while still allowing businesses to employ as many people as possible (for instance high school students in their first job who have minimal skills and few responsibilities). The graphic below, is from the United States Treasury Department. In 2014, a married minimum wage earner with two children, receives an additional $5,460 dollars of tax credits. Assuming that the average work year consists of 2080 hours at 40 hours a week, this would equate to an additional $2.63 an hour above the minimum wage. If we were to add the two, the hourly wage would be $9.88 an hour. This figure does not include any other state benefits, housing assistance, education assistance or other government program support. Summary: I have only touched on a few of the more common misconceptions that surround the minimum wage debate in America. The truth of the matter is, that many politicians will push for an increased minimum wage rate either because they know it will get votes or because they are ill-informed. The minimum wage has been raised in the past. It will be raised again. We cannot however afford to do so arbitrarily and without thoughtful and informed decision making. Plenty of ideas feel good but they have to make sense in the longer run. We need to do away with feel good economics and political ideologies that are crafted on ideals that are not grounded in economic truths. Policies that pander to populist ideas that will only hurt those that we intend to help.